A recent entry by Mike Treder at the IEET site (Institute of Ethics and Emerging Technologies) discusses the Singularity in connection with the upcoming Singularity Summit organized by the SIAI (Singularity Institute for Artificial Intelligence). I was totally unaware of this event until I visited the IEET site. Given what I know as a scientist about the likelihood of the Singularity, I couldn’t muster much interest. But ever the curious cat, I toddled over and examined the roster of speakers. All are white men. For several, their sole relevant qualification is that they believe in the imminence of the Singularity. I pointed this out in my comments at the IEET — and a SIAI representative informed me that they had looked really hard for qualified women and, since they found none, “would you rather we picked a token female with nothing to say?” Then one of the speakers chimed in, to let me know that “the gender war was a thing of the eighties”. It got even funnier after that, as more Freudian slips showed underneath the space suit of what passes for original progressive thinking. How highly qualified are those so carefully chosen for admission to the boys’ treehouse sanctum? Let me give you a whiff. One of the participants is a dotcom millionaire who has concluded that giving the vote to women doomed capitalist democracy. One of the two speakers that sorta kinda qualify as biologists is the originator of the concept of quantum microtubules (the biomolecular equivalent of Intelligent Design). The other stepped down from on high to deliver unto transhumanists the revelation that mitochondrial dysfunction is linked to cellular damage… a radical notion hidden away by those power-hungry biologists in, oh, every Biochemistry 101 textbook since the seventies. Of course, this representation is not surprising, since the participation of a bona-fide biologist in such an event would be the equivalent of an astrophysicist attending an astrologers’ convention. So I gave this some thought and came up with a solution that will give this event the unquestionable authority and nuanced expertise it deserves: Invite Sarah Palin. She’s as qualified as several of the speakers, her views on the future largely jibe with theirs, she’s all woman (no passé crap like feminism for her) and she’s just become available, so her fee should still be reasonable. Better yet, the SIAI should go for Anne Coulter. She’d fit the agenda and milieu even better, and her Ayn Rand-approved style would only further burnish the occasion. I’ll be sending the SIAI an invoice for program development consulting. Update 1: After the many discussions sparked by this article, SIAI included a female speaker in the program… a SIAI employee. This is so telling that comments are superfluous. Update 2: Women didn’t feel welcome at the SS (appropriate initials, come to think of it) nor comfortable with the ideas presented. I’m surprised… not. The “elixir of life” is rapamycin, an immunosuppressant used to prevent transplanted organ rejection. The maximum human daily dose for rapamycin is 5 mg. To receive the same relative amount as the mice were fed in the study, people would have to ingest 200 mg daily. This means that anyone who takes “longevity” doses of rapamycin had better live in a controlled, sterile environment. It also means that they’ll be prone to developing tumors. This is not a problem for mice, in whom cancer can be easily cured. Not so, by a long shot, for humans. Mice are extremely useful for dissecting molecular pathways and fairly useful as models for a long list of diseases. Their advantages are many and obvious: they’re mammals, so they share more with humans than the other organisms used in genetics – yeast, flies, worms, fish. Their generation times are short, their litters large. We can totally control their environment, though this affects their health and behavior. We can alter, delete or insert genes in mice and regulate when and where they express. 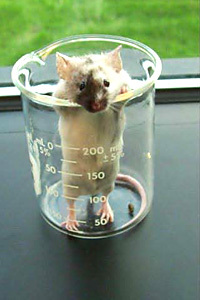 And mouse research is far less emotionally and ethically fraught than experiments on primates. However, as I never tire of saying, the devil’s in the details. 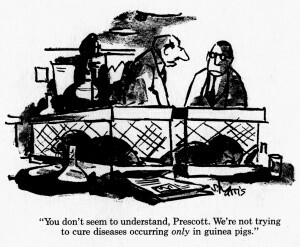 Mice are sufficiently different that drug studies, in particular, are better as proofs of principle than one-on-one mappings. Unlike us, mice are fast-metabolizing and short-lived. Drugs, nutrients and hormones are radically divergent in every mammal in terms of bioavailability, activity, metabolism and toxicity. Many drugs that showed exceptional promise in mice fared no better than placebos or essentially acted as poisons in human clinical trials. The social and behavioral wiring of the two species are totally disparate. For example, mouse sexual arousal and mothering behavior depend on smell pheromones. Mouse models of complex diseases are prone to over- or mis-interpretation. Does a compound stop a mouse from jerking uncontrollably because it’s a pain killer — or is it acting as a muscle relaxant? It’s even harder to correlate such complicated responses as learning, anxiety or depression. At the molecular level, many genes that are essential in mice are non-essential in humans and vice versa. Comparisons between the human genome and its recently completed mouse equivalent show that they diverge far more than previously recognized – close to 20%. Not only are there significant numbers of human-specific genes; equally importantly, genes whose structure is identical in the two species are nevertheless differently regulated. And last but decidedly not least, the two species have distinct regulatory RNAs (miRNAs for the truly curious). All this may sound esoteric, but the conclusion is simple: mouse models, especially those based on highly inbred strains, recapitulate only limited aspects of many human functions and diseases. This is particularly true of metabolism, neoplasty, lifespan and that troublesome jewel in the crown – the brain. Elixirs and panaceas for obesity, cancer, longevity and dementia remain stubbornly species-specific. So next time a brushfire sweeps the Internet with news of yet another miracle cure, the first and last question of non-biologists should be: what were (or when will we know) the results of the human tests? Cartoon: Sidney Harris, What’s so Funny about Science? 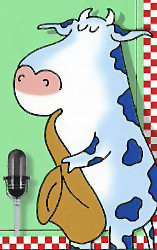 Come, My Lyre, My Heavenly Turtle Shell — Sing! I already expressed my opinion about Nisbet, Mooney and all other appeasers who insist that scientific illiteracy and resistance to science would disappear if only scientists were “nicer”. I won’t waste more time or thought on them, I have far more interesting things to discuss. 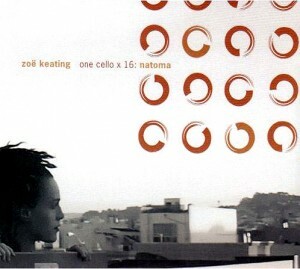 My multi-talented friend Kay Holt recommended the music of composer and cellist Zoë Keating. I just finished listening to her hypnotic album Natoma. She uses her instrument as a cello, a lyre, a drum. The warm tones of the cello come across like a dark-hued human voice. The pieces bring to mind the more melodious works of Philip Glass — but equally so, the elegiac yet soaring Celtic-tinged tunes in The Last of the Mohicans and Peter Gabriel’s haunting Biko, with its interweaving of Zulu drums and Highland bagpipes. Yours truly pontificates in the latest issue of Crossed Genres. And I don’t have even a Master’s in Futurism! Many thanks to Peggy Kolm, whose post about The Biology of Star Trek drew the editors’ attention, and to Kay Holt for the penetrating queries. Crossed Genres: We send astronauts up; we try to keep everything very clean and very sterile. Am I right in guessing that it just doesn’t seem viable if the population is going to stay there for very long? Athena Andreadis: Well, these are not self-sustained, long- term missions. The real reason for the sterility is not to contaminate exoplanetary samples. Also, if you read the fine print, you find out that one of the major and most time consuming tasks in places like the space station is scrubbing the fungus off of surfaces because there are no countervailing entities to take care of it. Not very heroic. All these macho alpha-type people up there going ‘scrubba-scrubba’. Posted in Biology & Culture, Science, Space Exploration, Writing & Literature | Comments Off on Fame is Beckoning! You are currently browsing the Astrogator's Logs weblog archives for July, 2009.